The highly polished finish on these 14K rose gold polished love knot earrings from Apples of Gold Jewelry offers a stylish take on an timeless favorite design! 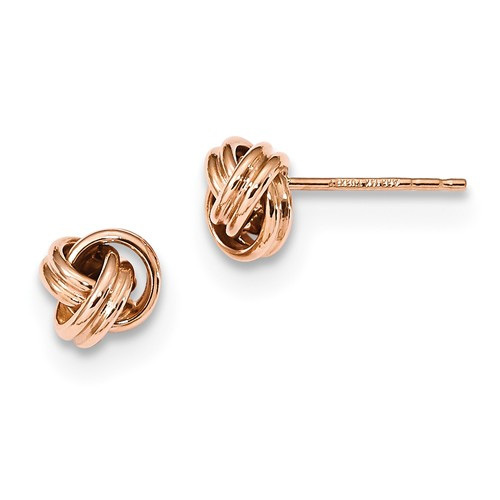 The warm pink of the rose gold on these love knot earrings is sure to please, offering a romantic twist to a beautiful item of jewelry. The love knot design is highly polished, with each earring measuring 7mm in size. These earrings are attached to a post and feature a push back closure design that will keep your earrings safe and secure while wearing. These earrings are the perfect romantic gift for the special lady in your life! We guarantee our 14K Rose Gold Polished Love Knot Earrings to be high quality, authentic jewelry, as described above.